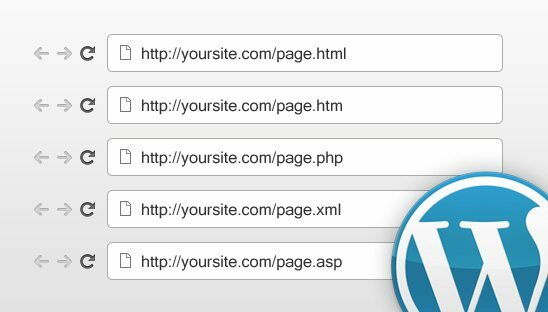 Daddy Design is proud to introduce, WP Page Extension, a new WordPress plugin aimed at alleviating the headaches of migrating a standalone website to WordPress. This plugin allows you to add the following extensions to the end of your pages; .html, .htm, .php, .xml and .asp. If you’re going to be migrating an old standalone website over to WordPress and are worried about all of your current backlinks and Google traffic being lost, this plugin is for you. Yes it’s true that WordPress has incredible built in SEO functionality but why would you want to lose any of your old hard earned SEO. Sure you could use 301 redirection on all of your old pages but that’s a lot of work with spotty results. Instead of relying on redirects or other methods, why not just keep your old URL’s intact by simply adding a page extension. This plugin is not a new idea but rather an improvement on what current plugins are lacking. WP Page Extension, unlike other plugins, allows you to change the extension on individual pages rather than a universal change to all pages. This allows greater flexibility with merging your old content into WordPress and doesn’t lock your new content into the old format. Another great benefit of our plugin is the amount of extensions available, included are the most commonly used extensions (.html, .htm, .php, .xml, and .asp). This plugin will not actually convert your code or pages into real HTML or ASP, it will only add an extension to the end of your URL. This plugin will only add extensions to the end of your pages and NOT your posts. This plugin will not work with the default WordPress permalink setting; you must change it to one of the other options. If you do not know anything about WordPress permalinks, click here to learn more. Upload the ‘wp-page-extension’ folder to the ‘/wp-content/plugins/’ directory. If you have any problems with this plugin or need help, please leave us a comment below and we will respond as soon as possible. Please do not email us with problems regarding this plugin, only comments will be responded to.